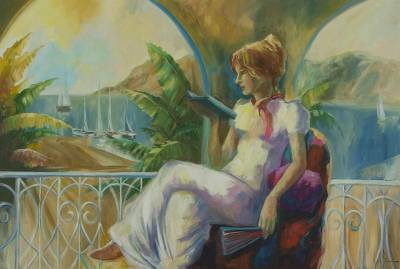 Romantic Impressionist Brazilian Portrait of a Woman, "Lady on the Balcony in the Sun"
A fan in one hand, she sits languidly on a sunny balcony overlooking the bay where sailboats come and go. All is peace and beauty in this evocative painting by Luiz Badia. Reveling in soft color and radiant light, the images are at once romantic and nostalgic. Titled "A Dama da Varanda Solar" in Portuguese. You can find 'lady on the Balcony in the Sun' by Luiz Badia in paintings categories such as People and Portraits Paintings, Impressionist Paintings and Acrylic Paint Paintings. Enjoy exploring these sections for other Novica treasures.